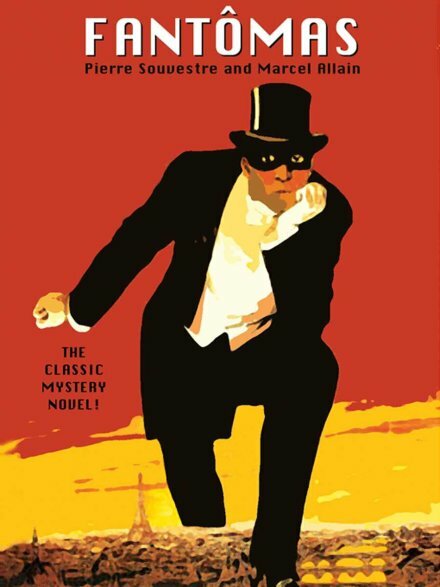 On this date* in 1909, in the first novel of the hit French Fantomas crime serial, the title character escapes the guillotine by having a duped actor beheaded in his place. Fantomas’s Wikipedia entry calls the character “a transition from Gothic novel villains of the 19th century to modern-day serial killers“: he’s a swashbuckling anti-hero who’s a master of disguise and perfectly okay with getting his hands bloody. The widow of that crime’s victim — also Fantomas’s lover — subsequently contrives to arrange a tete-a-tete with an actor then portraying Fantomas’s lurid crime spree on the Parisian stage. She wants him to come in costume, which excites the actor as a seriously macabre kink: little does this Valgrand suspect that his own tete will be swapped for the murderer’s by next light. That following day finds a drugged Valgrand infiltrated into Fantomas’s cell, in a sort of travesty of the noble Sydney Carton‘s guillotine switcheroo. Still suffering the effects of the potion his supposed inamorata has plied him with only hours before, and still made up to resemble the condemned man, he’s incapable of objecting as he’s hustled to the scaffold. Juve was watching the unhappy wretch, and could not restrain a word of admiration. The executioner’s assistants had bound the man upon the plank; it tilted upwards. Deibler grasped the head by the two ears and pulled it into the lunette, despite one last convulsive struggle of the victim. There was a click of a spring, the flash of the falling knife, a spurt of blood, a dull groan from ten thousand breasts, and the head rolled into the basket! But Juve … sprang towards the scaffold. He thrust the assistants away, and plunging his hands into the bran that was all soaked with blood, he seized the severed head by the hair and stared at it. And so he was … to the tune of a staggering 32 books over three years. Eat your heart out, J.K. Rowling. This series has enjoyed a number of adaptations to the screen, and indeed it’s a media milestone as well since the books were cranked out at record pace by a team of writers working simultaneously on modular chapters to meet publication deadlines that fed immediately into cinema deals. There were also comic and radio spinoffs, though they’re not known to have been forward-thinking enough to have had a website. In the classic first silent adaptation of Fantomas in 1913 (the book was published in 1911), poor Valgrand catches a break: he’s recognized and spared beheading at the last moment. There’s a very thorough guide for viewing that film here. * The book situates the action where Valgrand is seduced and tricked on December 18, and the narrative makes it clear that the execution itself is at dawn the next morning. Lady Beltham, whose feminine wiles spring the master criminal, subsequently commits suicide in 1910, which leaves only the one possibility. ** Juve is a big fan of the then-trendy, now-discredited system of Bertillonage; Fantomas consistently runs circles around this “scientific” crime-fighting. Academics, if you please? Through the incorporation of Alphonse Bertillon’s anthropometrics — the dominant mode of criminal investigation at the time –, as both the narratological and criminological impetus for its exponentially serialized representations of criminality, Fantomas articulates resistance to the representational strategies of the numerical classification of criminals as a means of social and “scientific” control, while compelling the ongoing modern capitalist cycle of mass literary production and consumption.